Technologically limited and outmatched by the Federation's Intrepid-class starship – indeed, on one occasion a raider was destroyed by a Federation shuttlecraft, albeit one that took them by surprise – an engagement with seven to one odds, in favor of the Kazon, against an Intrepid-class was considered "tactically unwise." The armaments aboard this class of vessel included two forward energy weapons and photonic charges with variable yields, and were protected with shields. The raider could be modified to employ a type of masking circuitry that could affect enemy sensors. They were also known to carry a small complement of Kazon fighters. 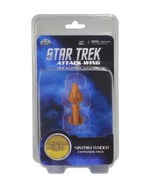 Regala Star Trek Attack Wing : Expansion Pack : Nistrim Raider!